can i do this Rain on Water effect? I wrote an Easel app to provide sinusoidal waves, but I don't know how such things get released. One possible "work around" would be to set all of the shapes to cut inside the path and then set the bit size to a larger diameter and use custom feeds and speeds for a smaller bit and actually cut with the smaller bit. That might get the result you are looking for. The is if you want to try and do it all in Easel. Another is to use Inkscape and make the Voronoi that way and import it into Easel as an SVG. 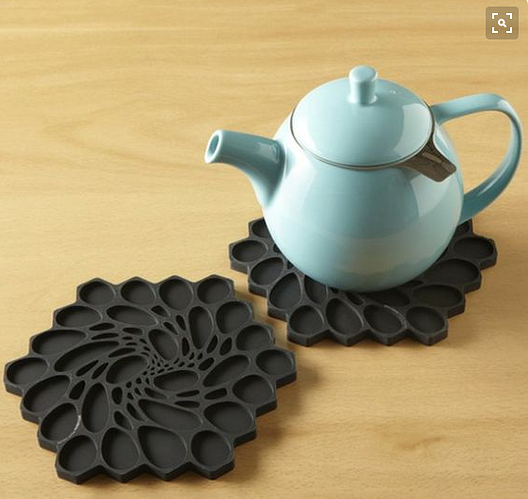 But in my example of the coaster above I would still want to carve out each whole shape because I don't want any little pieces flying around after they are cut out and breaking my bit. I'd have to be double sure that the tiny pieces were going to stay put after they were cut out for me to want to cut them out as outlines. This is where the rough and detail 2 stage cutting would come in handy and help save time. Fair enough, all depends how you're holding your work down etc. Just thinking if you were doing a large/thick piece, it would take forever. @GregJones: You make some very good points. I would like to revisit this app and make some improvements to it, and when I do, I'll see if I can incorporate what you are suggesting. We recently released a new version of our Easel app API, which will make it easier to make apps like this more powerful. 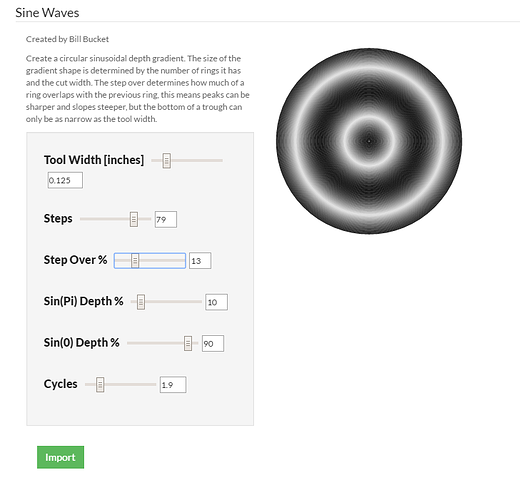 @BillBucket: Have you tried carving out those sine waves? If so, what kind of bit did you use and how did it turn out? Have you cut any of these? I'd love to see the results. @JeffTalbot My machine usually only operates for a day or two before I decide I need to upgrade something on it. 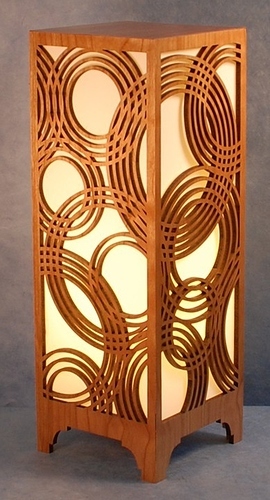 I just got it put back together again, so I'll do a little test carve of the sine waves. 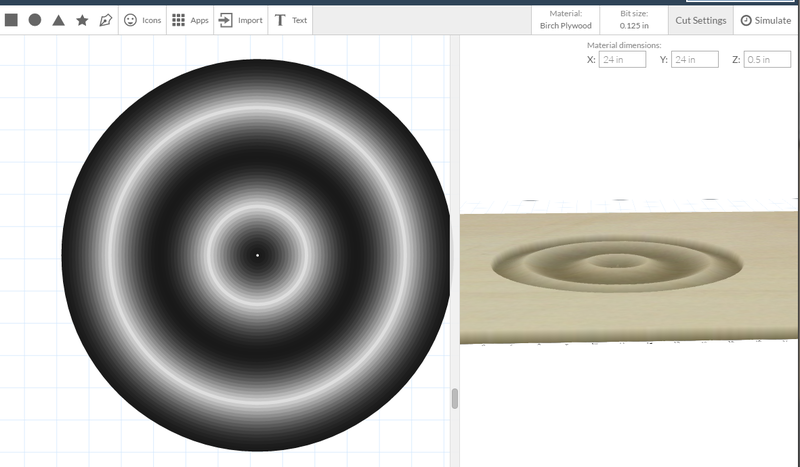 I haven't looked closely at the 2.0 API, but I think it will make such 2.5D carving much easier. Especially if my app can schedule a second stage finishing pass. Will this do real 3D milling? Or will it do it as 2.5? Set Z height, make circle. Decrease Z height, make circle, etc. This is an isoline carving, which is inherently done the way you've described. As far as I know Easel will always be making g-code to cut along input vectors (not interpreting 3D geometry and planning vectors along it), but I'm not sure if it will ever allow anything besides 2D vectors in a 3D space (flat vectors at different heights). Unless it can interpret true 3D vectors, it won't ever be doing true 3D carving. Svgs, the basis for Easel designs (as far as I know), kind of allow for 3D vectors through gradients, but it's a sort of meta-attribute, not a true 3D vector. I think it can be tricked to do some pretty close approximations, but they're going to be very inefficient. I figured it was a limitation of Easel. When can we expect Easel3D ? I am curious to see how it works. Smallest ball-nosed bit would give the smoothest cut. Does the simulation work? What kind of cutting time are you looking at? I can't comment on Easel3D, my guess is never. Simulation works, cutting time is between one to eight hours, depending on all those settings. I'll try a few small ones soon. I can't give a timeline for 3D carving, but the answer isn't "never." fusion 360 design that reminded me of some of the images here. Something like 7 hours but it took me 3 try's before I flushed out all the x carve bugs. I also use the the "Voronoi Generator" more then any other app and I love it! 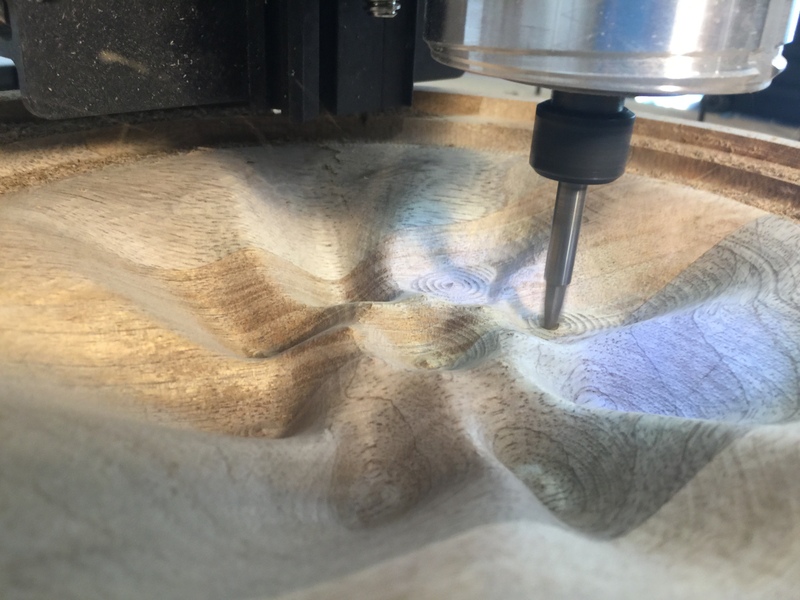 Did you use Fusion 360 to generate the toolpaths? I've published a new version of the app called "Voronoi Generator 2.0 [BETA]" if anyone would like to test it out. I'd love to hear your feedback. Warning: I haven't actually tried cutting anything with this yet. I just finished writing it a few minutes ago. Yes! I would like to use this!